The penalty which Germany should pay as a defeated nation was fixed at $33,000,000,000. Germany was unable to pay such a sum. The Dawes Commission (1924) proposed a plan of reparation payments which all interested nations accepted. Payments were to be in proportion to Germany's economic condition. The Young Plan (1929) fixed the amount of reparations at approximately $8,800,000,000. In March, 1935, Germany, through Der Reichsführer Adolph Hitler, announced the repudiation of the armament section of the treaty. 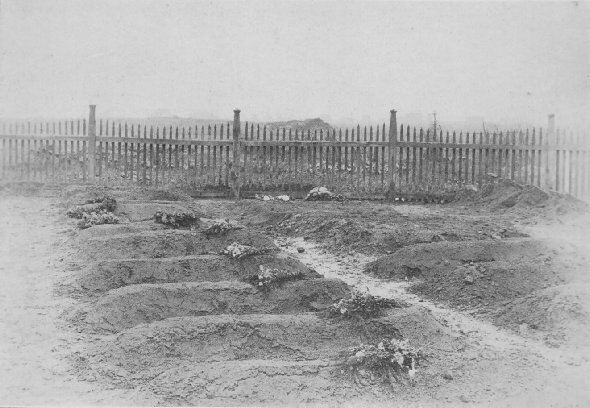 American graves unmarked in German cemetery. Strasbourg. Who they were or how they died is unknown. U. S. "Prisoners or Missing" on Nov. 12, were listed at 22,724. By 1919, when Colonel Ayres compiled his statistics, the number unaccounted for was reduced to 4,500. The latest (1935) figures are 2, 913. We are fairly safe in assuming that this represents the number of unknown American dead. The total "unknown" for all nations runs into hundreds of thousands. After all these years, the governments continue to use the ambiguous terminology, "Prisoners or Missing".